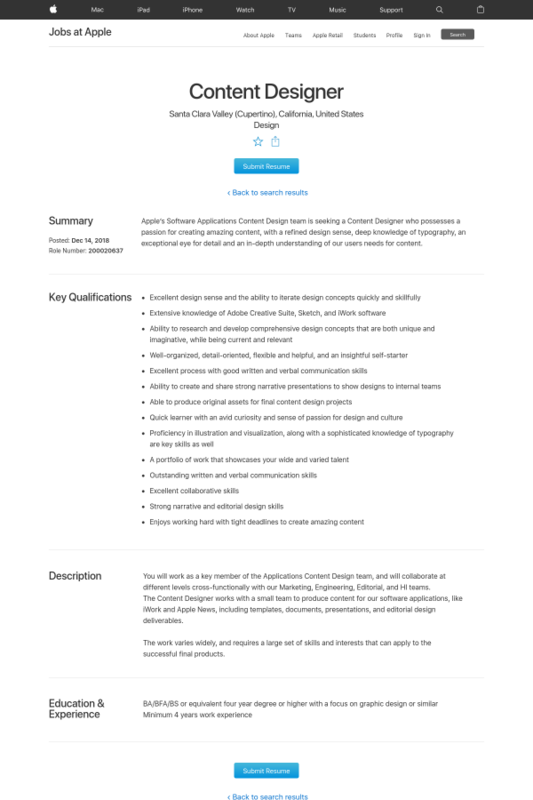 Apple’s Software Applications Content Design team is seeking a Content Designer who possesses a passion for creating amazing content, with a refined design sense, deep knowledge of typography, an exceptional eye for detail and an in-depth understanding of our users needs for content. You will work as a key member of the Applications Content Design team, and will collaborate at different levels cross-functionally with our Marketing, Engineering, Editorial, and HI teams. The Content Designer works with a small team to produce content for our software applications, like iWork and Apple News, including templates, documents, presentations, and editorial design deliverables. The work varies widely, and requires a large set of skills and interests that can apply to the successful final products.